Before President Donald Trump signed an executive order temporarily halting the U.S. refugee program, Americans were sharply divided over the threat that refugees from countries such as Iraq and Syria posed to the United States. In early January, the partisan gap in these opinions was wide, but the age gap was about as large – and had widened since last year. Trump’s executive order suspended refugee admissions for 120 days and barred entry by Syrian refugees indefinitely. It also temporarily blocked people from Iraq, Syria and five other countries in the Middle East and North Africa from entering the U.S. In early January, 46% of the public said “a large number of refugees leaving countries such as Iraq and Syria” was a major threat to the well-being of the U.S. About a third (35%) considered this a minor threat, while 16% said this was not a threat. Other international threats ranked higher. About eight-in-ten Americans (79%) called ISIS a major threat, 71% said the same about cyberattacks from other countries and 64% called North Korea’s nuclear program a major threat, according to the survey, conducted Jan. 4-9 among 1,502 adults. Older adults were far more likely than young people to view the large number of refugees from Iraq and Syria as a major threat. A majority of adults 50 and older (58%) viewed the large number of refugees from nations such as Iraq and Syria as a major threat, compared with 43% of those ages 35 to 49 and just 31% of those younger than 35. About twice as many Republicans and Republican-leaning independents (63%) as Democrats and Democratic leaners (30%) said they considered refugees to be a major threat to the country. The ideological differences were even more pronounced: 70% of conservative Republicans and Republican leaners said refugees represented a major threat, compared with just 19% of liberal Democrats and Democratic leaners. 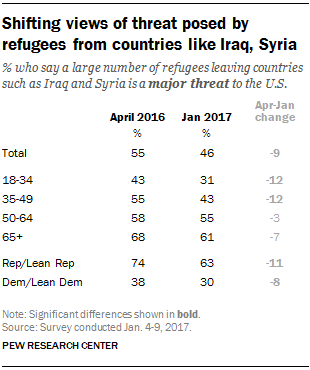 Overall, the share of adults who said refugees from Iraq and Syria posed a major threat fell by 9 percentage points between April 2016 and last month, especially among younger adults. 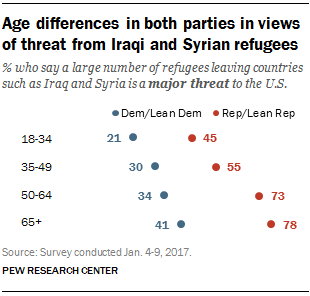 Last month’s survey also found age differences in both parties in views of the threat from Iraqi and Syrian refugees. Fewer than half of Republicans younger than 35 (45%) said these refugees were a major threat, compared with 78% of Republicans ages 65 and older. Among Democrats, just 21% of those younger than 35 saw refugees as a major threat, about half the share among those 65 and older (41%).